Mourning Becomes Electra is a play cycle written by American playwright Eugene O'Neill. The play premiered on Broadway at the Guild Theatre on 26 October 1931 where it ran for 150 performances before closing in March 1932. In May 1932, it was revived at the Alvin Theatre (now the Neil Simon Theatre), and in 1972 at the Circle in the Square Theatre. Captain Adam Brant – of the clipper "Flying Trades"
The story is a retelling of the Oresteia by Aeschylus. The characters parallel characters from the ancient Greek play. For example, Agamemnon from the Oresteia becomes General Ezra Mannon. Clytemnestra becomes Christine, Orestes becomes Orin, Electra becomes Lavinia, Aegisthus becomes Adam Brant, etc. As a Greek tragedy made modern, the play features murder, adultery, incestuous love and revenge, and even a group of townspeople who function as a kind of Greek chorus. Though fate alone guides characters' actions in Greek tragedies, O'Neill's characters have motivations grounded in 1930s-era psychological theory as well. The play can easily be read from a Freudian perspective, paying attention to various characters' Oedipus complexes and Electra complexes. Mourning Becomes Electra is divided into three plays with themes that correspond to the Oresteia trilogy. Much like Aeschylus' plays Agamemnon, The Libation Bearers and The Eumenides, these three plays by O'Neil are titled Homecoming, The Hunted, and The Haunted. However, these plays are normally not produced individually, but only as part of the larger trilogy. Each of these plays contains four to five acts, with only the first act of The Haunted being divided into actual scenes, and so Mourning Becomes Electra is extraordinarily lengthy for a drama. In production, it is often cut down. Also, because of the large cast size, it is not performed as often as some of O'Neill's other major plays. Act I It is late spring in front of the Mannon house. The master of the house, Brigadier-General Ezra Mannon, is soon to return from war. Lavinia, Ezra's severe daughter, like her mother Christine, has just returned from a trip to New York. Seth, the gardener, takes Lavinia aside. He warns her against her would-be beau, Captain Brant. Before Seth can continue, however, Lavinia's friend Peter and his sister Hazel, arrive. Lavinia stiffens. If Peter is proposing marriage to her again, he must realize that she cannot marry anyone because Father needs her. Lavinia asks Seth to resume his story. Seth asks Lavinia if she has noticed that Brant resembles members of the Mannon family. Seth believes that Brant is the child of David Mannon (Ezra's brother. Not in the play) and Marie Brantôme (a Canuck nurse), a couple expelled from the house for fear of public disgrace. Suddenly Brant himself enters from the drive. Calculatingly, Lavinia derides the memory of Brant's mother. Brant explodes and reveals his heritage. He tells her Lavinia's grandfather (Ezra's father) also loved the Canuck nurse, and so jealously cast Ezra's brother out of the family. Brant has sworn vengeance. Act IV The night after Ezra's funeral, Brant's clipper ship appears at a wharf in East Boston. Christine sneaks out to meet Brant on the deck, and they retire to the cabin to speak in private. Lavinia and an enraged Orin (who followed their mother from the house) listen from the deck. Brant and Christine decide to flee east and seek out their Blessed Islands. Fearing the hour, they painfully bid each other farewell. When Brant returns, Orin shoots him and ransacks the room to make it seem that Brant has been robbed. Act I, scene 2 In the sitting room, Orin grimly remarks that Lavinia has stolen Christine's soul. Death has set her free to become her. Peter enters from the rear and gasps, thinking he has seen Christine's ghost. Lavinia approaches him eagerly. Orin jealously mocks his sister's warmth toward Peter, accusing her of becoming a true romantic during their time in the Islands. Act III A moment later, the scene switches to Hazel and Peter in the sitting room. Orin enters, insisting that he see Hazel alone. He gives her a sealed envelope, warning her to keep it safely away from Lavinia. She should only open it (a) if something happens to him or (b) if Lavinia tries to marry Peter. Lavinia enters from the hall. Hazel tries to keep Orin's envelope hidden behind her back, but Lavinia rushes to Orin, beseeching him to make her surrender it. Orin complies, after Lavinia admits she loves him, and agrees to do whatever he wants. Orin then tells Hazel goodbye forever and tells her to leave. Orin then tells his sister she can never see Peter again. A "distorted look of desire" comes into his face and he tells her he loves her. Lavinia stares at him in horror, saying, "For God's sake—! No! You're insane! You can't mean—!" Lavinia wishes his death. Startled, Orin realizes that his death would be another act of justice. He thinks Christine is speaking through Lavinia. Peter appears in the doorway in the midst of the argument. Unnaturally casual, Orin remarks that he was about to go clean his pistol and exits. Lavinia throws herself into Peter's arms. A muffled shot is heard, as Orin commits suicide in the other room. In 1947 the play was adapted for film by Dudley Nichols, starring Rosalind Russell, Michael Redgrave, Raymond Massey, Katina Paxinou, Leo Genn and Kirk Douglas. It was nominated for Academy Awards for Best Actor in a Leading Role (Michael Redgrave) and Best Actress in a Leading Role (Rosalind Russell). In 1967, the Metropolitan Opera gave the world premiere of an operatic version, composed by Marvin David Levy to the libretto of William Henry Butler. Both film and opera retain O'Neill's title. In 1978, a five-hour television miniseries was produced for and shown on PBS' Great Performances, which starred Bruce Davison, Roberta Maxwell and Joan Hackett. It was well received by the critics, Joan Hackett in particular being highly praised for her portrayal of Christine. There are literary readings that classify Mourning Becomes Electra in the naturalism movement. This is based on O'Neill's focus on violent emotional states of men to emphasize the subconscious and inner spiritual forces as well as man's inability to escape the cyclical pattern and outcomes of human action. Like the Oresteia, the play explored the theme of revenge, where the crime of the past determine the actions and the suffering of the protagonist in the present. For this theme, some observers note that O'Neill's approach is more similar to William Shakespeare's outlook in Hamlet than Aeschylus' in Oresteia. O'Neill also differed with Aeschylus on the theme of fate and the role of the gods in the lives of men. In Oresteia, as was the case in the classical Greek tragedies, the divine is part of the environmental forces that humans cannot control but determine their fate. In O'Neill's interpretation, these forces are eliminated in favor of Freudian and Jungian psychology. ^ Newlin, Keith (2011). The Oxford Handbook of American Literary Naturalism. Oxford: Oxford University Press. p. 433. ISBN 9780195368932. ^ Berlin, Normand (2000). O'Neill's Shakespeare. University of Michigan Press. p. 103. ISBN 0472104691. ^ a b Singh, Balwinder (2016). Modern Tragic Vision. Raleigh, NC: Lulu Press. p. 52. ISBN 9781365050770. O'Neill, Eugene (1931). 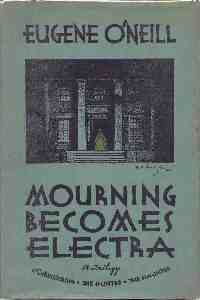 Mourning Becomes Electra: A Trilogy (First ed.). New York: Liveright. OCLC 7257106. This page was last edited on 5 April 2019, at 21:22 (UTC).